It should come as no surprise that a cat’s needs change as they grow older. Just as humans develop age-related health conditions and lifestyle needs, so do our pets. Cats can and often do develop arthritis, renal conditions, joint deterioration and other such troubles as they age. As such, it is up to us as responsible pet parents to give our cats the care they need as their bodies and needs change during their senior years. It sounds reasonable that when a cat hits a certain age of approximately 8+ years they would be gradually switched to a senior diet of cat food. If only it were so simple. With the assistance of a veterinarian to help pet owners stay informed, our feline pets can grow old gracefully and with the dignity they deserve. Just as humans do, when cats grow older their energy levels tend to reduce over time. A previously highly active cat may curtail the amount of play they fit into a day, while cats that enjoyed to go for a roam outside frequently may well decide they prefer to stay inside. As our feline friends begin to sleep more and eat less, decide against performing as many acrobatic feats across fences, countertops or leaps to the top of the bookcase, we need to work towards accommodating these lifestyle changes too. A cat showing less interest in play is also not only just about a reduction in energy level. 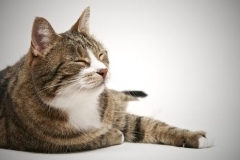 As the body gets older, most cats will suffer from some form of arthritis or deterioration of joint health. Those high leaps become unthinkable, and even jumping up to the couch can be painful. When a cat begins to show signs of discomfort from activity or an unwillingness to make those previously effortless leaps, consulting with a veterinarian is the first course of action. As cats become senior, regular checkups with the veterinarian become of vital importance, with a physical and bloodwork done at least yearly. These scheduled visits can monitor for age-related health conditions and a cat’s overall wellness as they continue aging. To the untrained eye it can be very difficult to tell when cats are ill, they are experts at hiding weaknesses. If you have an aging cat, talk to your vet today about how you can give your cat the quality of life that years of friendship and companionship merits.